The App is also usable offline and no particular installation is required. Design your App form ad hoc: you’ll facilitate the work of the operator, who will be guided in the picking activity from the warehouse with a checklist of goods to be taken from the different loading units. This way there will be no errors or omissions. Barcodes can be read with the best supported industrial devices (ZEBRA, DATALOGIC, INTERMEC) or with a simple smartphone. With TDox you get effective traceability and efficient administration and you have everything under control. 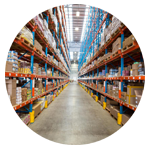 All warehouse movements are digitally entered via smartphone or tablet and end up directly on Excel, already formatted, without having to enter them manually. From office you can check your balance at any time. TDox offers an integration system via WEBAPI, which allows you to connect it to any IT system in use in your company to ensure an immediate and complete exchange of information.